Hi friends! Hope you are having a wonderful start to this holy month of Ramadan. Today, I am sharing with you guys a dish that I love to find on the dinner table. 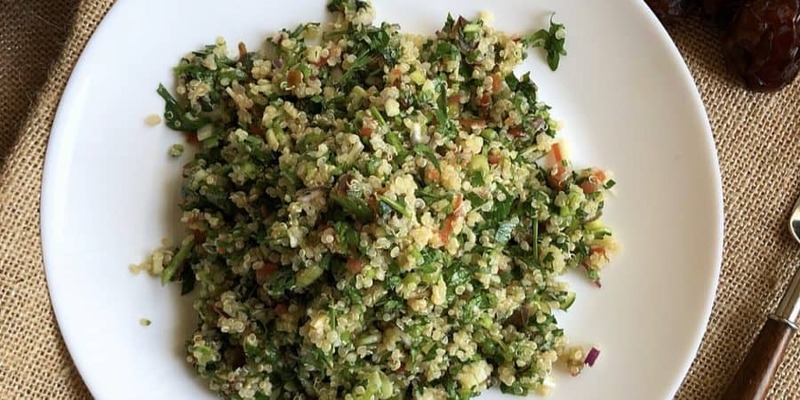 It is tabbouleh! 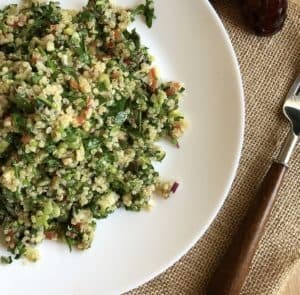 How many of us love tabbouleh? It is so refreshingly good. This salad along with Fattoush are hands down my favorite Middle Eastern salads. The key is to have a balanced dressing and finely chopped veggies. 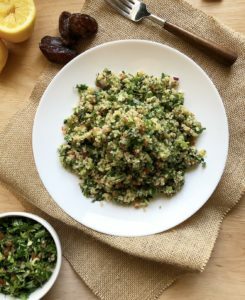 Those finely chopped veggies are what make the tabbouleh a tabbouleh along with the cracked wheat which I substituted with quinoa to make this dish a tad healthier and gluten free! I also like the taste of some sweetness with acidity; that’s why I added the finely chopped date. That’s completely optional but it adds another flavor profile. In a small bowl, mix together the dressing ingredients. This can be made hours earlier or even a day ahead. That way the flavors of the dressing will marinate longer together. In a large bowl, add the minced parsley, chopped tomatoes, chopped green and red onion, and chopped cucumber. Add the cooked quinoa to that along with the dried mint & dates. Top with as much dressing as you like. I like to go heavy on dressing but some people don’t. About 3-4 tbsp should be fine; taste it and if you want more than add more! Season with additional salt and/or lemon if needed.